Wilderness Camp is on the lake below the vast Purcell Wilderness Conservancy Provincial Park. It is the beautiful alluvial sand and pine forest delta of Fry Creek. The creek is more a large stream or small river. This delta shows ample signs of a dynamic history with previous riverbanks in different locations. Until recently Fry Creek had two major channels, and most campsites were located in the pines on an island formed between the two arms of the creek. The north arm of the creek typically carried more water but in late June 2013 the same heavy rainfall that caused flooding in Calgary caused Fry Creek and other Kootenay Lake creeks to overflow. Fry Creek rearranged its course, abandoned the north arm and now flows fully in the south arm. The south arm became deeper and wider and we lost campsites on the delta island. Large new sand beaches were deposited. Looking down the enlarged center arm of Fry Creek later in the summer of 2013. Our 2013 campers were not affected by the event as rain occurred in June – the heaviest rain month here – and before we start our camp on July 1st. Some local campers on the site at the time had to move in the early morning to avoid the rising water. The flooding was attributed to the major rain event falling on the already melting high mountain snow pack. There was also a major event in 2012 following a very wet spring causing landslides throughout the area including one in Johnson’ s Landing in the next valley to the north, about three kilometres away. 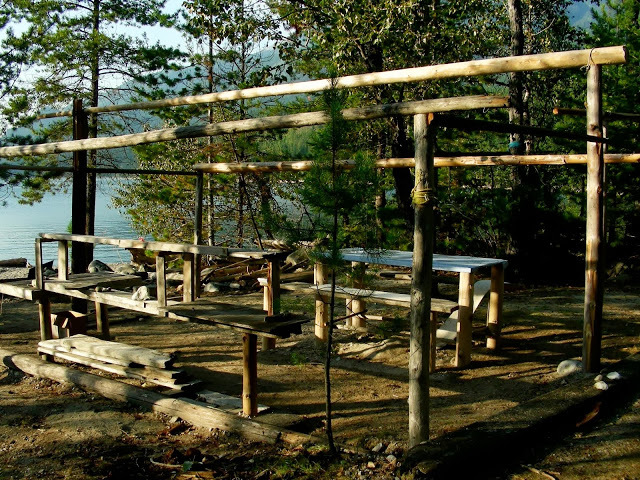 Wilderness Camp is only accessible by boat, in the past from the beach at Johnsons Landing. 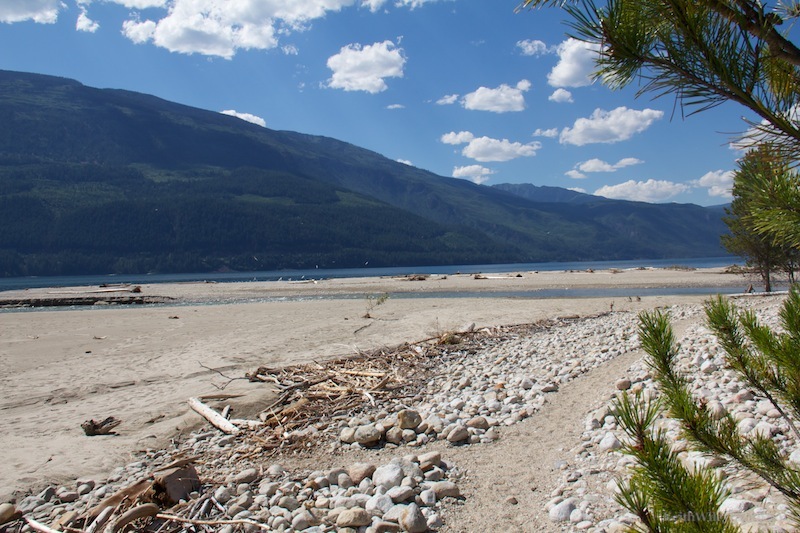 We have now changed our access to the beach at Schroeder Creek Resort north of the small town of Kaslo. This change saves about an hour driving time to get to camp. See How to Get Here. View of the creek and delta from a boat on the lake. After the 2012 Johnson’s Landing event, the Wilderness Board asked a geoscientist for a safety assessment of the Fry Creek Camp location. The report indicated that our camp is not vulnerable to a direct landslide but we should always pay attention to the possibility of rising waters during exceptionally large rain events and respond accordingly. It would take an even larger rain than in June 2013 to fill the new enlarged watercourse and concern our campers. We camp near the creek so we are always aware of its flow in our daily activities. Campers should be atuned to all conditions around us – that is why we spend time in nature. Large new beaches were created in 2013. Our sadness over the lost sites was interwoven with exhilaration and awe at nature’s power and beauty. Walking the land helps to understand the changes in this dynamic alluvial delta. You can see the changes from 2013 but also how the geography was created over many centuries. We marveled at the new sand beaches that replaced our gravel and rock beaches. We had the excitement of building new trails, comfy biffies and new campsites with shelter frames ready to receive next year’s tarps and kitchens. One of the long-standing campsite frames that continues on site.